This post is courtesy of our contributor Carolyn…I have been lucky enough to move into a beautiful little town with the biggest feeling of community I have ever felt. Mix that with the magic of Christmas and I’m one happy lady today! In a previous post I wrote I said I loved Halloween…well folks, the truth is I love all holidays! In fact I am going to start celebrating some of the uncommon ones Cheryl has created activity ideas for. Anyways back on track…our playgroup’s annual Christmas party is the biggest party we plan for the year. A gift for each child, snacks, food supplies, decorations, and one very important special guest needed to be found and planned for! Here is how we planned our community Christmas party. 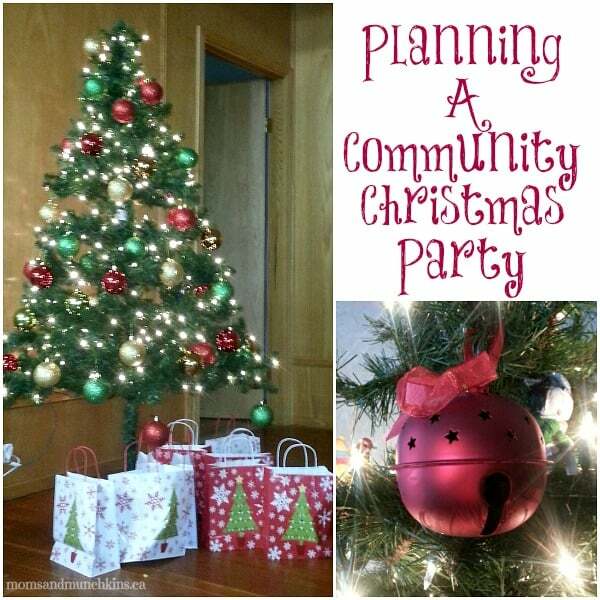 Community Christmas Party – Party Tips! There were forty children to buy gifts for so the easiest way for us busy moms to accomplish this was to keep the gifts uniform. Each child received a $10 gift card and a Christmas bell with the year and the name of our playgroup on it. We topped off their gift bags with seasonal chocolates and candy canes. You should have heard the jingling around the hall! Decorations were also basic, a tree with twinkly lights and colorful bulbs plus a few sparkly festive ornaments throughout the hall. The main attraction and guest of honor was Santa. We decided to hand out presents and let all the children talk to Santa prior to taking the children’s pictures with the big guy. This shortened the dreaded fussy antsy wait time from child to child and worked out quite nicely! We decided on snack foods because they were easy to prepare and the party would be held in late morning so no one would be hungry for lunch yet. 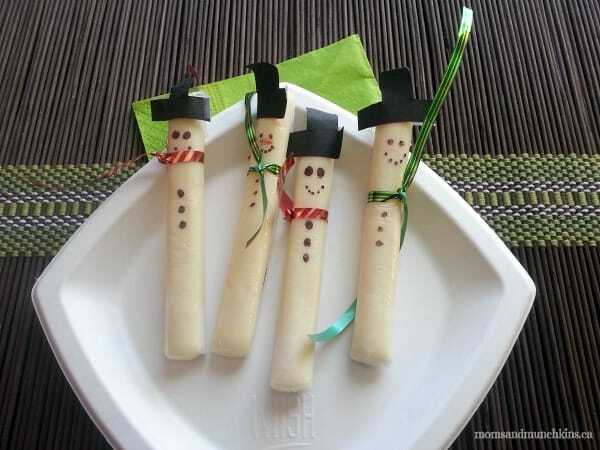 We kept the snacks basic except for the adorable cheese string snowmen one of our crafty mamas made. She must be pretty patient cutting out all the little snowmen top hats! The idea inspiration for this adorable snack was courtesy of Pinterest. Thanks to Whish in Edmonton, Alberta for having a savvy sense of what we needed for our event and for helping us choose items that were beautiful and matched our décor! 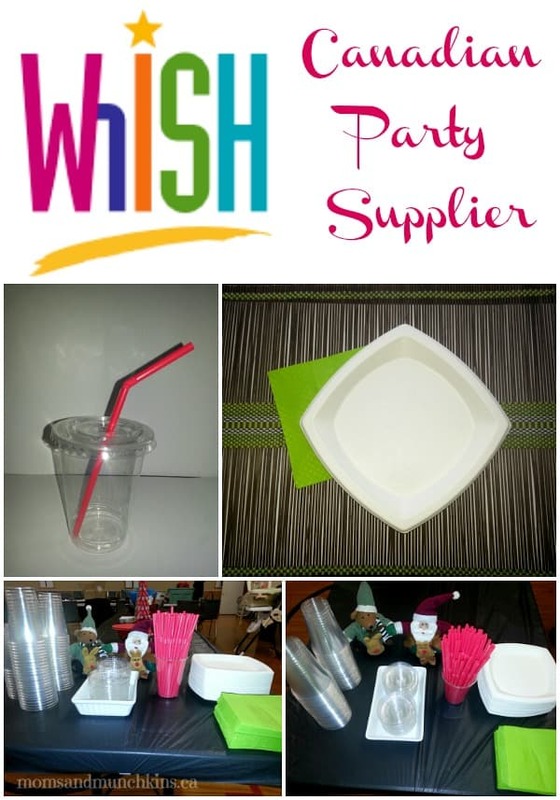 From their website we ordered Sugar Cane Dessert Plates, lime green napkins, clear plastic cups with lids and bright red flexible straws. The cup-lid-straw combo were the big hit of the food table – all the moms and tots alike loved them! They were small enough for the children to get their hands around and the lid ensured no-to-minimal spillage! We also ordered a big plastic bowl that was large enough to hold the popcorn puffs. I must not forget the little red candy coated chocolates which were a little too sweet for me but a lot of the moms were grabbing them by the handful! The snacks were eaten, the presents were handed out, and the children laughed and played! It was another successful community Christmas party thanks to the wonderful ladies I work with in our community! For more holiday ideas, visit our special Christmas Fun page. Multi-Coloured Pom Pom Appetizer Picks – Adorable! Silver Foil Chandelier – I can think of so many parties that I could use this in! 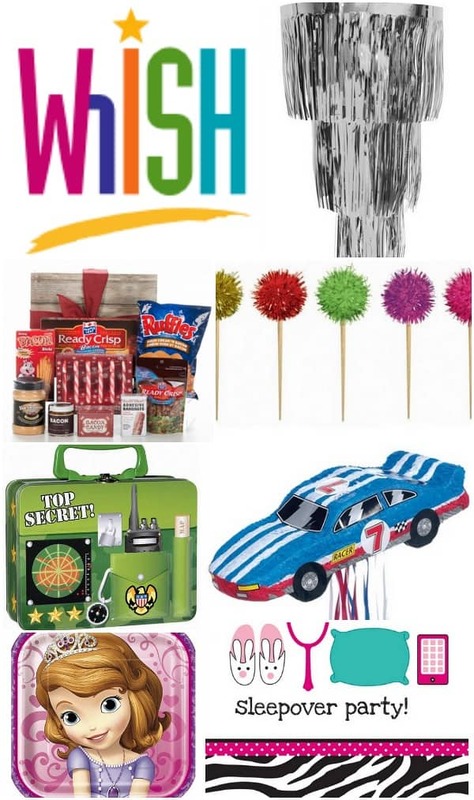 Now you have a chance to win a $75 Gift Code to Whish! This giveaway is open to Canadian residents only who are at least 18 years of age. Winning entries will be verified prior to contacting the winner. The giveaway ends on December 20th, 2013 at 11:59 p.m. EST. A winner will be drawn randomly on December 21st. The winner will be notified, by email, and will have 48 hours to claim the prize. If I do not receive a response from the winner within 48 hours, a prize forfeit will be assumed and a new winner will be chosen randomly. Winner has 90 days to report non-fulfillment of prizes. By entering this giveaway, you verify that you understand and meet the prize eligibility requirements. Please note that Moms & Munchkins is not responsible for sponsors that do not fulfill their prize. We have represented each sponsor with the expectation that they will fulfill their prize in a timely manner. While we are not responsible, we will make every effort to assist the winner in obtaining their prize. Once the winner claims the prize, his/her name will be posted on the Giveaways page. The winner’s email address will then be sent to the sponsors so they can contact you with your prize information. The value of the giveaway is a $75 gift code for Whish. This has no cash value and cannot be combined with any other offer. If the winner lives in the Edmonton area, they can pick up their item free of charge from the warehouse or, if it is to be shipped, the $75 can also go towards flat rate shipping. All entry methods on the Rafflecopter form below are optional; however, the more entries you complete the better your chances are of winning. THIS GIVEAWAY IS NOW CLOSED. Congratulations to Michelle T.! For more ideas for Christmas games, free printables, activities, snacks & more, visit our Holiday Fun page. *Disclosure: We received party supplies in exchange for an honest review. All opinions expressed here are my own. I would have to pick the Confetti Celebrations 40, because we are hosting a 40th birthday party next year. I really like the Luau / Beach theme! I love the Ladybug 1st Birthday! My favorite theme is the Noah’s Ark Baby Shower. I am having a baby shower for our Daughter in January. She just had a new baby boy last week. Since this is her second baby, we decided to have the shower after the baby was born. I will definitely be using this company for all of the shower needs. Thank you for introducing me to this company and for the super giveaway opportunity. Keep up the terrific blogging. I love on the go 1st birthday, so perfect next year for my son’s first! My favourite party theme on Whish.ca is the Stanley Cup NHL Hockey Party. Merry Christmas, and good luck to all! I like the Stanley Cup NHL Hockey Party theme. I love the Hollywood Glamour Theme! My son’s 5th birthday is January 6th and it is so hard to find birthday items/décor right after Christmas. I am local to Edmonton and would love to win this. I just about died when I saw the star wars giant wall decals, especially darth vader!!!! How perfect for a star wars party and then to decorate his bedroom with!!! <3!